The Dartmoor Knife CSK185. Photo: Paul Kirtley. When I was a teenager in the 1980s I used to read every word and scrutinise every picture of the catalogue produced semi-annually by a company called Survival Aids. It was full of hard-to-find survival equipment. There were two products in the catalogue that I wanted more than anything else – a DPM Ventile smock and a Wilkinson Sword Survival Knife. For a young lad with little pocket money, however, they were expensive and therefore unobtainable. Later on I did manage to get hold of one of the knives and I enjoyed using it compared to the cheap survival knives I’d had in the past. To be honest, though, back then I didn’t really know what I was doing. I had relatively little skill with a knife. Recently I was surprised to learn that the Wilkinson Sword Survival Knife is still available. I was surprised because Wilkinson Sword (the sword and knife maker as opposed to the razor blade manufacturer) ceased trading in 2005. The final production version of the Wilkinson Sword Survival Knife was something of a redesign of the original, officially renamed the Dartmoor Knife CSK185, the latter being an acronym for Combination Survival Knife with a blade length of 185mm. After the company went under, the remaining stocks of Dartmoor knives were sold off. It is these knives that are available from www.dartmoorknife.co.uk Knives are available in various states of finish, right up to mint condition and boxed. I recently had the opportunity to try one of these out. The contents of a boxed Dartmoor Knife. Photo: Paul Kirtley. Even in 2005 the Dartmoor was something of a throwback. 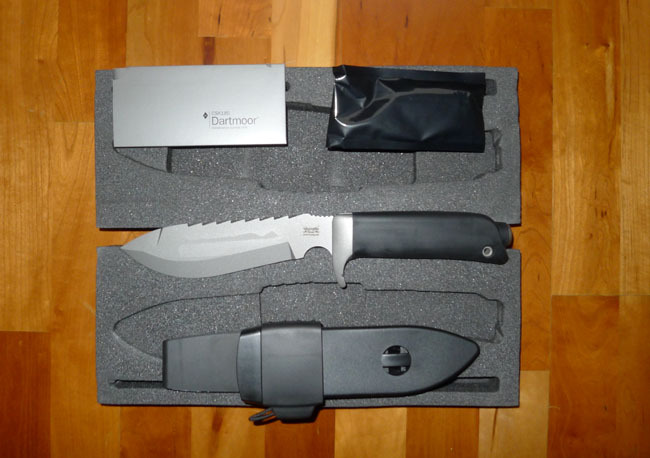 The Dartmoor was a revised version of the original Wilkinson Sword Survival Knife, designed in the 1980s by Ray Mears. In the picture caption on page 15 of his ‘Survival Handbook’, published in 1990, Mears writes “The Wilkinson Sword survival knife, designed by the author to combine the ideals of a woodsman’s knife with the requirements of the expeditioner”. Wilkinson Sword Survival Knife (top) and Dartmoor Knife CSK185 (bottom). Photo: Paul Kirtley. Survival knives polarise opinion – hated in some quarters, an invaluable tool to others. The Wilkinson Sword Survival knife is no exception but those who love them still have their knives in use after many years of service. The Mk I and Mk II Wilkinson Sword knives are collectors’ items that are hard to come by. A large knife is just a bit too ‘Rambo’ isn’t it? 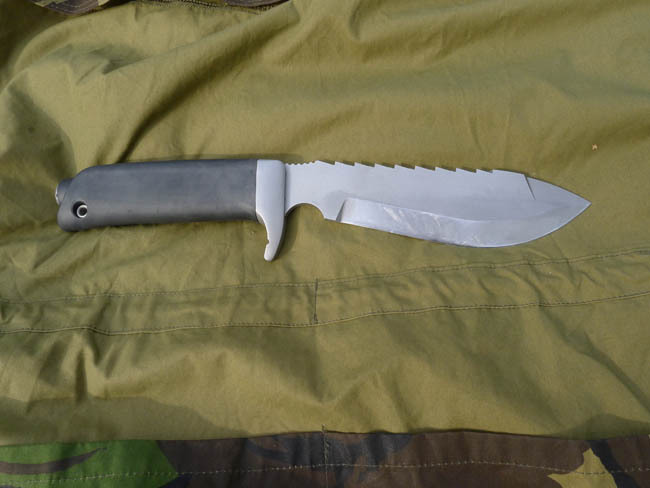 Taking their lead from Jimmy Lile’s original ‘Rambo Knife’ design, many survival knives produced during and since the 1980s have been pretty large. At 310mm long and weighing 0.815Kg with scabbard and survival kit, the Dartmoor Survival Knife is sizeable but by no means the biggest. Only recently has Bear Grylls re-popularised smaller survival knives, first with his custom Rob Bayley knife and now with Gerber. Since the bushcraft revolution of the nineties and noughties, many of us have grown to love small knives with blades no longer than the width of our palms. So, to many people nowadays, a large knife just seems wrong, brash, uncouth even. But is this view based on experience or on fashion? It’s worth remembering that survival knives are not bushcraft knives (at least not in the sense that we use the term today). A survival knife is a product designed first and foremost to help you out of an unspecified difficult situation whatever or wherever that may be. With this broad brief, survival knives are often designed to be jack-of-all-trades (sometimes making them master of none). Just because a survival knife won’t carve like a little Mora clipper or fell trees like a Gransfors Small Forest Axe doesn’t mean it has no value. 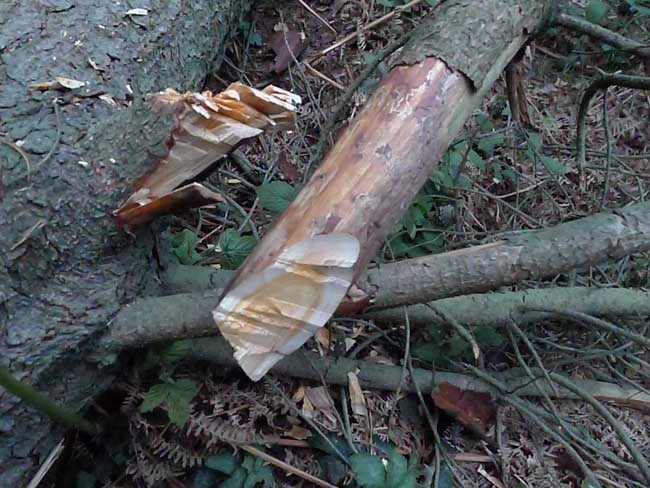 Moreover, in survival situations, carving spoons or felling trees are rarely top priority. Put yourself in the middle of nowhere, possibly with no idea where, having to address the basic priorities of survival. It is with this general situation in mind that survival knives are conceived. It is also with this in mind that survival knives often include additional survival kit. So what is included with a Dartmoor Survival Knife? 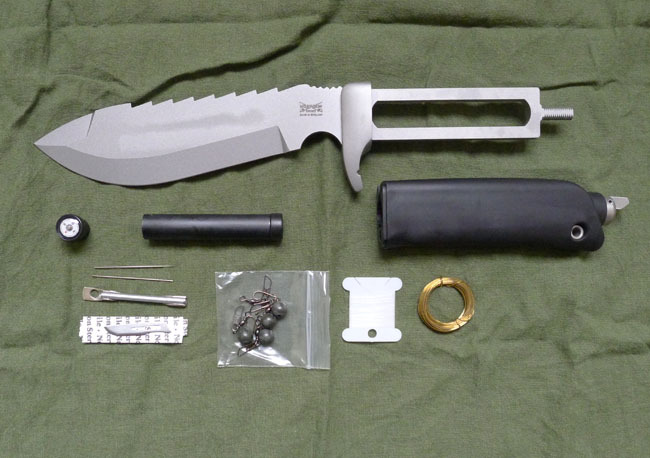 Expanded Dartmoor Knife CSK185 showing survival kit and cut-out tang. Photo: Paul Kirtley. The Wilkinson Sword Survival and Dartmoor knives have a full tang but the tang has a cut-out. 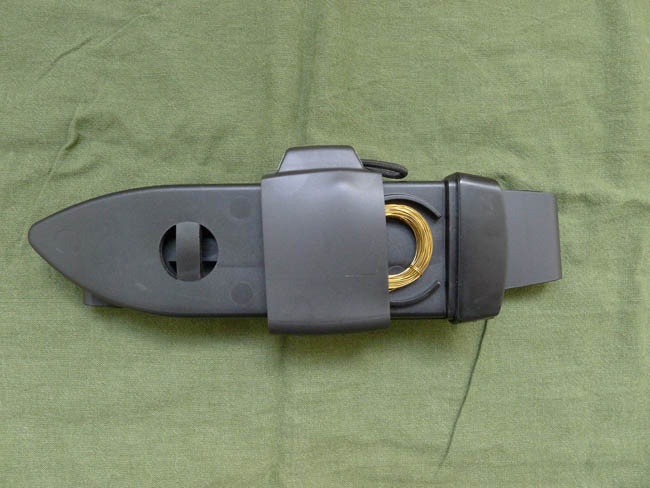 Contained in the handle, within this cut-out, is a small tube designed to contain items of survival kit. A criticism of the Dartmoor knife that I have read somewhere on the web is some of the survival kit – particularly the snare wire and fishing line spool – doesn’t fit in the knife handle. The negative implication was that these items have to be carried separately from the knife and the rest of the kit. What is less than obvious is that there is actually a storage compartment on the sheath (something added to the Dartmoor sheath that wasn’t a feature of the original Wilkinson Sword Survival Knife). This storage compartment is clearly explained and illustrated in the knife’s instruction booklet, so I’m not sure why it remains such a mystery. Dartmoor Knife CSK185 scabbard compartment revealed. Photo: Paul Kirtley. I managed to fit the snare wire and the fishing line into the storage compartment on the sheath with no problems. With the exception of two of the half-dozen overly-large fishing weights supplied with my knife, the remainder of the survival kit fits into the handle. If you simply replace the supplied weights with smaller and more dense weights, then everything easily fits on the knife. I’m told by the supplier that some knives were kitted out with cylindrical weights which fit into the kit much more easily. Either way, it’s no big deal for you to swap the weights to the type you want. You may well want to customise the fishing kit anyway. Over the years Wilkinson Sword Survival knives have received some negative reviews of their cutting ability. I think one of the reasons for this is that the knives used by reviewers were blunt. This may seem an obvious statement but it’s surprising that even brand new Wilkinson Sword Survival knives have always arrived quite blunt. I don’t know why. It’s all the more baffling because it is possible to attain a sharp and durable edge on these knives. If you are going to get the most out of one of these tools, you need to sharpen it. This can involve quite a bit of effort. The booklet included with the knife states, “The blade is hardened and tempered for optimum edge retention and toughness”. This type of language also normally tells you the knife is hard to sharpen. I spent several hours sharpening the Dartmoor by hand and then the knife had a much better edge and was a lot more useable. What you don’t get with a Dartmoor knife is any means of sharpening in the field. Therefore it’s worth taking a small stone such as a Fallkniven DC4 with you to keep the knife sharp. The emphasis here is to keep the knife sharp – remember to sharpen or get the knife properly sharpened before you head out with it. Trying to get a really sharp edge in the field with only a DC4 would be a long job. The sharpening stone could be taped onto the back of the sheath. This would also give you a supply of duct tape or similar. Note this would prevent you from accessing the storage compartment in the sheath unless you removed the tape and sharpening stone. I don’t think this would be a big deal because the idea is you won’t be using the survival kit items unless it’s an emergency. So, once the knife is sharpened, the survival kit is stowed on the knife and you’ve added a sharpening stone, the knife and kit is set up and prepared as it can be. The best way to review a piece of outdoor equipment, whether it is a knife or a canoe or anything else, is to go and use it for its intended purpose. So, it was thus I decided to get a good measure of the usefulness of the Dartmoor Survival Knife by heading out to the woods for a few days with little else to see how well this survival tool served me. The idea was to put myself into a mock ‘survival situation’ and try the knife out from this perspective. I had only the clothing I was wearing – a cotton shirt, a synthetic fleece and a Ventile smock, cotton/synthetic mix trousers, socks and hiking boots. While the single-layer Ventile would give me some rain protection, I had no Gore-Tex or other similar raingear. In the pocket of the smock was a light wool hat. The tool I was to rely on - a sharpened Dartmoor Knife. Photo: Paul Kirtley. For equipment I took the Dartmoor Survival knife set up as described above. This was mounted on a belt along with a pouch containing a water-bottle and a metal mug. I took a few other items – a cuts kit, a military dressing, a torch, a whistle, a hank of paracord and a compact camera. I also wore the watch I always wear. I had no backpack or daypack, no food, no shelter, and no sleeping equipment. Given I knew this situation was coming, I made my scenario less relaxed by not giving myself all day to get organised, build a great shelter, etc. I started my exercise at 17:00 with only three and a half hours until dark. First I scouted for possible shelters. I found a fallen tree that would do for at least the first night. The sky was clear and I didn’t expect rain. It was early May though and I expected the temperature to drop to between 5 deg C and zero, particularly with a clear sky. I would survive the night without a fire but I’d definitely be more comfortable and get more rest with one. If you try to sleep directly on the ground you lose a lot of heat via conduction. I collected some boughs from nearby evergreens to create an insulating mattress. 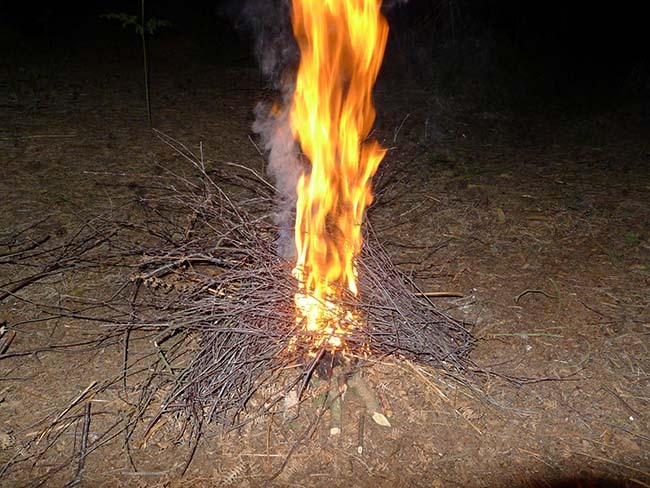 Then I started to collect materials for a fire. I knew I had a fireflash in the knife handle so I wasn’t particularly stressed about getting my fire going. All I needed was some material that would catch a spark. Down the hill was a pond containing greater reedmace, Typha latifolia. The dry fluffy seed heads catch a spark well. I stuffed one of my pockets full of this material. 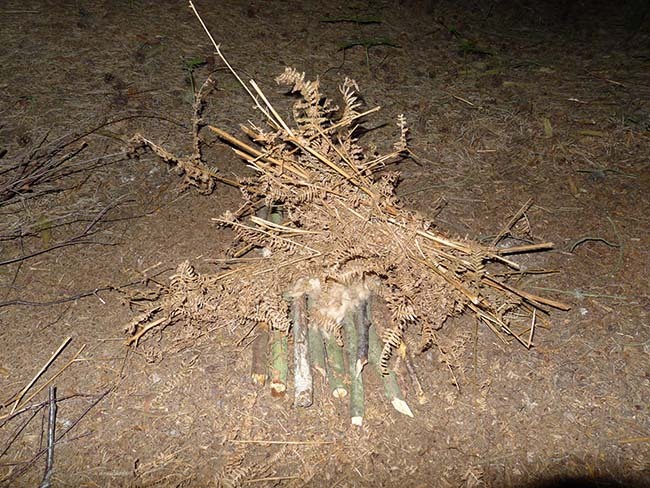 Then I collected small match-stick thin sticks, mainly birch, and some dried bracken Pteridium aquilinum. This would be the makings of my fire. I stowed my kindling off the ground within my shelter then set about collecting some larger firewood. I found another fallen tree, this time a pine, and proceeded to remove some of its limbs. 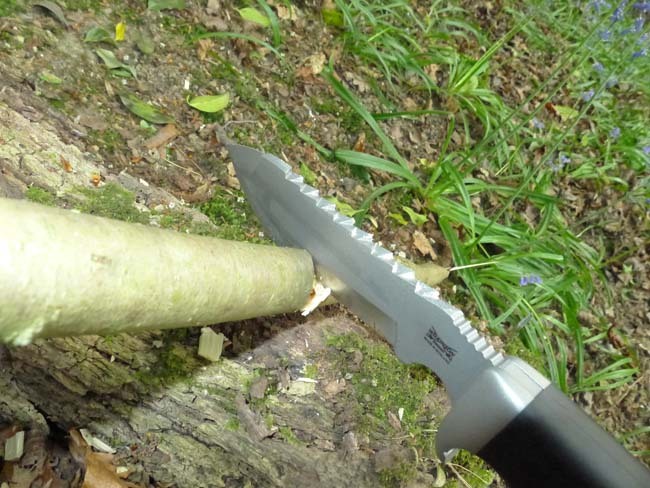 I decided to use the Dartmoor to take off the larger branches and the survival knife made a good job of this heavy chopping. The Dartmoor Knife made easy work of heavy chopping. Photo: Paul Kirtley. After accumulating a good pile of firewood I decided I would get some of my food-acquisition assets working. 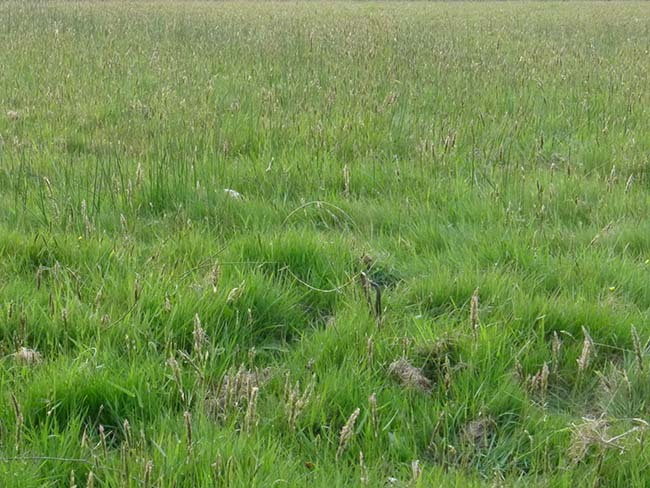 In scouting around earlier I had spotted some rabbit runs. The Dartmoor comes with 6 metres (18 ft) of brass snare wire and this is enough to make two rabbit snares of six strands each. There are no brass eyelets supplied with the knife so any snares made with just the wire provided would be illegal in the UK. I had made up two rabbit snares with free-running brass eyelets before I set out so that I remained within the confines of the law (I also had the land-owner’s permission). I found some hazel from which I would make the snare pegs. I began to saw the hazel with the saw-back of the Dartmoor and initially it made good progress but then it began to stick a little. I’ve been spoilt over the past 10+ years by using a Bahco Laplander folding saw. The Dartmoor saw-back works but no-where near as well as a specialised tool such as a Laplander. What I discovered was the saw back of the Dartmoor cuts a notch quickly but once the notch becomes too deep and too much metal of the side of the knife is in contact with the wood then the friction starts to make it stick. This is because the width of the saw is the same as the rest of the blade. Sawing with the Dartmoor Knife. Photo: Paul Kirtley. The Dartmoor is much more effective at chopping than sawing so I cut the snare pegs to length with a light chopping action. I also used this chopping action to point the pegs at the bottom and bevel them at the top. I notched the pegs and then created a chamfer to retain the paracord I would attach the snares with. Preparing snare pegs. Light chopping with the Dartmoor Knife. Photo: Paul Kirtley. After the snares were set, it was dusk. So, I quickly collected some easily identifiable and available plant foods – stinging nettles, Urtica dioica and ramsons, Allium ursinum and returned to my shelter, where I left the plants. 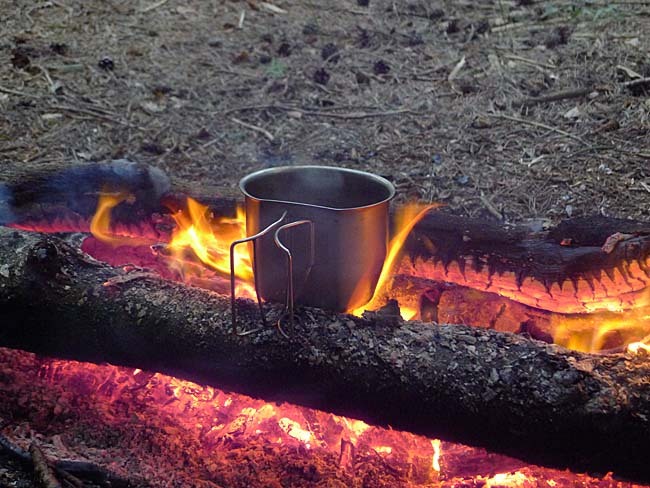 I then went to get some water in my metal mug, which I could boil once I established my fire. Rather than collecting water from the murky pond where I collected the reedmace seed-heads, I took clear running water from a stream feeding it. Even though this water would still need to be boiled, it was clear and lacked turbidity, which would otherwise have needed to be filtered out. I now returned to my shelter and organised my fire. I cleared the ground and put down a platform of dry wood. On top of this I placed a bundle of greater reedmace seeds then dried bracken then the birch twigs. I gathered some slightly larger fuel together to add once the initial fire was established. Fire lay with cat-tail and bracken. 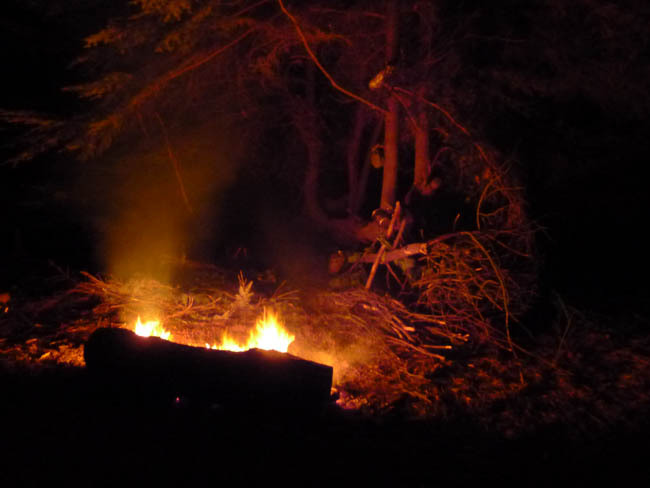 Note also the platform of dead wood to keep materials off the damp ground and provide fuel at the heart of the fire. Photo: Paul Kirtley. Even though the firestick from the knife’s survival kit is thinner and shorter than the Swedish Firesteels that have gained popularity in recent years, it can produce a decent shower of sparks. I found the best part of the knife to bring into contact with the firestick was a sharp angle of the saw-back of the knife. This easily produced a shower of sparks onto the fluffy seeds, which caught immediately and burnt quickly, which in turn ignited the dry bracken. Seconds after dropping sparks onto the cat-tail seeds, the fire is esablished. Photo: Paul Kirtley. Firelighting is a key skill. Fire boosts morale. Once I had established my fire I could boil water, prepare food and keep myself warm. I had gathered a good collection of decent-sized branches and small logs. I fed my fire with these throughout the night and this kept me warm. In the morning I boiled more water for a warm drink of water mint, Mentha aquatica, tea. I also wilted some nettles, Urtica dioica over the fire to neutralise the stings. I had collected these plants in passing while getting organised the previous evening. I really like fresh-mint tea and nettles are remarkably filling, so I was happy. This breakfast set me up for some food gathering and I set off – still quite early in the day – first to check my snares. Nothing. The snares were untouched. Photo: Paul Kirtley. I then went to find some more plant foods. I checked a likely area for pignuts, Conopodium majus, and hit the jackpot. I then spent some time collecting these delicious little tubers. These formed my second breakfast. I could taste their food value and they were remarkably sustaining. I searched for more plant foods; In collecting ramsons, Allium ursinum, which were in flower, I discovered a number of insects in the flowers. In digging for roots, I also found some grubs. I collected some of these in a small plastic bag from the survival kit. I used the fishing equipment from the knife to set some static lines, baited with some of the insects and grubs. I then collected more firewood and improved my shelter to weather-proof it a little in case the weather took a turn for the worst. 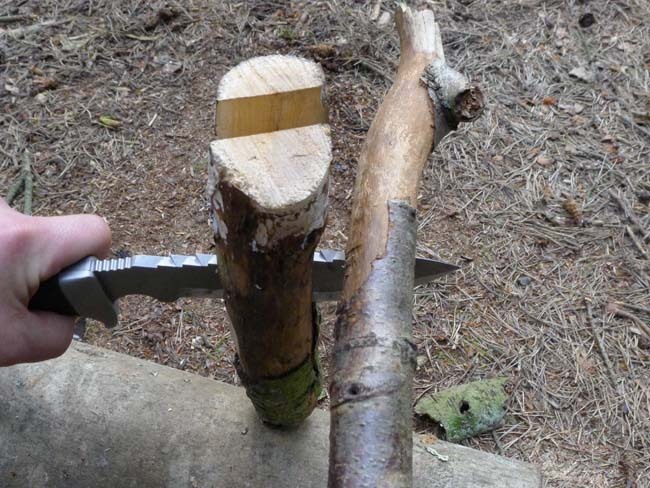 Over the few days I was out, this is what I used the knife for most – chopping and trimming shelter materials and chopping and splitting wood for the fire. Splitting firewood with the Dartmoor Knife was a breeze. Photo: Paul Kirtley. These days our diet provides us with quite a lot of water. Consequently, when you are not eating as much you need to drink more water than usual. Even though I was getting some plant foods into my system I wasn’t getting enough yet as I had been spending time on other things. I got into a routine of boiling water, putting some into my water bottle to cool then boiling more and adding some mint or chopped scots pine, Pinus sylvestris needles for a flavoured drink. Boiling water in my metal mug. Photo: Paul Kirtley. The next morning, one of the snares was knocked but nothing had been caught. I re-set the knocked snare and left. Nor had the static fishing lines produced any fish. Later I tried some hobo fishing but had no bites. I was getting some carbohydrates from plants and this diet would keep me going for a significant amount of time. I wasn’t going to run out of cat-tails any time soon. I would need to get some protein at some point though. My shelter was good and I had a ready supply of firewood. I was happy being out in the woods at a great time of year. Improvised shelter and a warming fire. Note the bedding. Photo: Paul Kirtley. After having attended to my initial priorities I was using the knife less and then only for the same tasks I had already used it for. After three days my time was up anyway. I had to go home the next day. So, on the fourth morning I dismantled my shelter and cleared up after my fire. I was unlucky and somewhat disappointed with my snaring and fishing but that is the way it goes sometimes. It’s worth being realistic about how these things work. In the past I’ve set a handful of snares and got nothing for several days then caught three animals in one morning. Other times you can get something almost straight away. For me this illustrates why it’s important also to have a good knowledge of plant foods. Part of what interested me in going out with the Dartmoor Knife was to nudge myself out of a comfort rut. There is a flexibility that comes from using unfamiliar equipment. In a survival situation is everything going to be the way you want it? Unlikely. So it was interesting relying on a tool that I wasn’t used to. How did the Dartmoor perform as a survival tool? I think it served me very well. I was able to do everything I needed. At times I had to modify my technique to get the most out of the knife or to make up for a shortfall (such as with the saw) but I was glad to have it with me. I lived in the woods for several days and felt no worse for it. This experience highlighted for me – as other experiences have in the past – that skill and knowledge are the most important things. They weigh nothing and you carry them wherever you go. It’s also important not to become overly precious about particular tools and learn to have the flexibility to use what is at hand. had one of these for a few yrs now and gave it a hard time but now the locking nut in the handle wont stay folded down and cant seem to get a spare ……it doesnt get used now but is staying with me for the memorys and good times we had together !! Maybe the nice people at http://www.dartmoorknife.co.uk can help you with your spares requirements? Are you my younger, slimmer, with more hair on top, vastly more knowledgeable but slightly less handsome twin brother?! I used to eagerly await every new issue of the Survival Aids catalogue and made trips to the shop in London (Euston?) and on Deansgate in Manchester. Bought a cheap pair of Lundhags in the Manchester shop that lasted me well for years. Rather than going for the Wilkie I went for Lofty’s knife and still have it. Could never get it sharp (probably lack of skill at the time) and grew out of big knives so it sits in the cupboard waiting for me to eBay it. Also found the handle to be oddly uncomfortable. 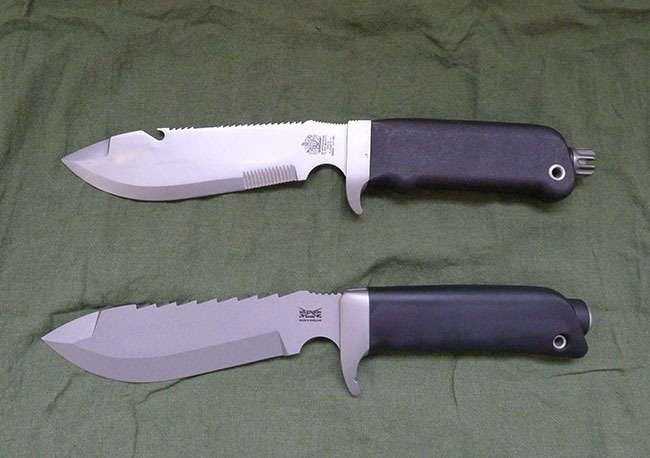 Would loan it to you if you wanted to try a side-by-side comparison with the Dartmoor knife. Maybe you could do another 3 days in the woods. By the way – congrats on setting up the new company. Hope I have the opportunity to drop by some time. I’m glad to hear I wasn’t the only one; it’s nice to have the occasional trip down memory lane. My parents took me to the original Survival Aids shop in Morland, Penrith and I bought a Mauser Officer’s knife, which I still have and use. Someone recently told me they are really hard to come by these days. If I decide to do another big knife review, I may take you up on your offer. I’ll see how popular this one is first…. Thanks for your congrats. It would be good to see you if you are passing. I had the Mauser too, with the bottle opener on the end of the saw and the cover for the saw blade. It was a nice knife but it disappeared one day – probably because it was green and needed a bit of red lanyard on the keychain. One thing that I didn’t know was that RM had designed the Wilkie – quite a major omission on my part when I think about it. Another things that is stirring in the recesses of my mind is that it’s possible that I might have bought the Lofty knife from Ray’s company before I knew anything about him. Don’t have the packaging or paperwork anymore. I know it would have been before your time, but do you think that’s possible? Last story on the Lofty knife. I had it sent to work and it was poorly addressed so reception did not know who to give it to. So they opened it and freaked out thinking it was some kind of security threat. I did suggest that anyone wanting to intimidate the company would be sending razor blades or broken glass rather than a rather expensive hunk of metal in a presentation box! Haven’t seen one of these for a while, I can remember reading about them in Combat and Survival mag way back when I was knee high to a Omocestus viridulus. All the best with the new venture, maybe I’ll see you on a course one day. Hello again Paul, what an interesting article and demo of the Dartmoor survival knife.As a young apprentice in the 80s i too used to drool over the survival aids catalogue and the Dartmoor survival knife,however with my small wage packet at that time after paying the folks for my keep plus other bills there was no way i was able to afford one. Determined to have a survival knife i purchased a Parker brothers survival knife with hollow handle, i was over the moon.I took it with me when i joined the services and was the brunt of many Rambo jokes,but i still have the knife today , i keep meaning to take it out and try it again but it it just feels so alien now i cant bring myself to use it. A very good read Paul, thank you. I bought one of the last runs of these just before WS went under. It realy does make a good ‘chopper ! ( It will chop all day straight from the box IMHO, but needs work on the Edge, diamonds or a re-grind, to get the best from it. Another ex-Survival Aids fan here – and I still have my Mauser Officer’s Knife and Helly Hansen fibre pile jacket as well! Liked the article Paul – it felt very ‘old skool’ (is that what they call it? ), and there’s nothing wrong with that as far as I’m concerned, especially as ‘survival’ is a bit out of fashion right now, or so it seems in the current bushcraft world anyway. Great looking Knife, i want one, lol. Great review & artical Paul, i enjoy reading all of them. I never had pocket money when I was a kid so I could never buy a knife or anything. I remember my friend had a survival knife that had a hollow handle and a compass on the end. I was really jealous! We used to go down the woods and make shelters and traps and things and for some reason we used to put trip wires along the path. We made them with white string and rubbed mud on them so you couldn’t see them. The mud worked quite well as camouflage but I think the string snapped before it tripped anyone up! lol! we were about 8-9 at the time. Was tempted to buy one of those on ebay a couple of times a few years back now. They form a part of ‘British Survival’ history I guess – a good bit of memorabilia?? Obviously better than just another ‘Ramboesque’ style of knife…..
A very interesting test of both man and his knife. Perhaps the most ‘telling’ comment you made was “..I was happy being out in the woods….”. Having some sort of ‘tools’ , ‘the knowledge’ and as importantly or possibly most importantly a postive attitude towards your surroundings and circumstance will allow you to ‘survive or prosper’. Having watched a documentary a couple of years ago , I am sure you know the one, about a British camera man who had to survive for 30 days in the Alaskan wilderness. I have never forgotten the big message it had for me..retain a clear agenda, carry a sense of humour and don’t let your sitaution get the better of you. He had some knowledge , a reasonable amount of kit and contact with the outside world – but he lacked the mental strength and will power to cope. It was all very telling. Sorry if not allowed to put this on here, any suggestions for pages to sell this knife would be greatly appreciated. I’m selling a black Dartmoor knife with all the trimmings. As good as the day it was purchased. Check out details on facebook knife selling page. Another quality article. I’m glad your questioning the knife style and status thing as there are a lot of collectors/instructors out there who miss the point about what knives are for and merely collect em to display or show off to those who aint spent a fortune on a knife in a oneupmanship fashion. Knives are to be used and not kept in boxes collecting dust. I personally don’t like the design of the mears wilko knife, or the newer design and after me and my bro swung around my uncles knife as kids it still hasnt grown on me to this day, but if i was in any situation and thats all i had then it would be the best knife on the planet for me. The one thing that is awesome is the fact you can have a full tang albeit with a section missing to be able to stash a load of survival goodies like your pics show or even just some sweets for a much needed sugar rush. haha. It also has good chopping ability but with the smaller knives now used you can just use a baton and hey presto. But the most important thing is that it has a bloody sharp blade that can cut and thats all that matters. Skinning animals and butchering can be done with any knife. Carving aint something i bother with as i’m of the ‘crude but it works’ and ‘that’ll do’ school of carving and survival/wilderness living. I leave art to the artists. Many bushcraft schools are pushing that carving is so important and that certain knives ie the ones your discussing are’nt any good for the wilds but they miss the key point of what a knife is about. For a start, fashoin has jack sh*t to do with practicality or survival and is merely a flight of ego. Put any dude in a crappy situation and they’d want a knife. And these dude’s would take any knife in a heart beat beit blunt or sharp. I recently said to a top class bushcraft instructor that we’re heading down the wrong paths as its slowly becoming how to survive with 5 grands worth of kit/needless ego massaging junk. He was none to impressed but he must have me confused with someone who gives a sh%t. haha. Skill is what counts and in any situation it doesnt matter if you have a metal knife, a bean can lid, a shard of glass a stone/bone blade or a set of animal gnashers, you simply work with the tools you have and work within the limitations of said tools so as not to wreck em if thats all you have. If native dudes around the world have manged with stones for 95% of our history then i’m mighty chuffed i have a great little mora with a wooden handle for less than £25. I don’t need anything more and our ancestors would kill to have it. Working with what we have, treating it well and looking after it is all that matters, the rest is pointless bullsh*t. The same instructor once said my knife wasnt very sharp to which i said ‘hold out your wrist’. The offer was politely declined and it instantly became sharp. haha. My knife does what i want it to do and not what someone else wants me to do with it. Thats veri important to me. Like that great saying in a certain war film ‘this is my rifle, there are many others like it but this one is mine’. The same goes for knives, what i have is mine and i can do what i need to do with it, so i dont care if other folks have bells and whistles on theirs, flash hero names or if it cost them hundreds of pounds. Improvisation is something that is being lost yet to me it is a core if not the most important core skill of life and it applies to knives also. Modern life and society i think stifles improvisers as we all get brainwashed to follow others and use stuff that everyone else classes as ok/acceptable. Sod that. So i guess what i’m saying about all this, is it boils down to your inner john rambo. Something that has become a joke but its not. Everything is an exstension of your mind and body and when the sh*t hits the fan only those with that inner john rambo spirit will make it regardless of knives, flash gizmo’s and number of bushcraft courses attended. Training and tools obviously are important but your spirit is what will get u through knife or no knife. Great post! Not because of the knife angle, but because I really enjoyed reading about you living out a genuine wilderness situation for a few days. I loved the step by step analysis of what you did and how you did it… more like that please! Ah, I remember Survival Aids. I bought the Ventile smock, rather than the knife, and it’s still going strong. I had a similar-ish knife at the time but I forget the make. It also had a hollow handle, in which there was a survival kit. What was different was that it had a hole through the blade, which could be matched with a lug on the scabbard to make a set of wire cutters (like modern bayonets? ); or you could screw in a set of barbs to make it into a fish spear! A toy, perhaps, but it did also have a sharpening stone built into the scabbard, so the person who designed it knew something. I’m guessing the most affordable knife in this category is the MoD survival knife? Assuming that is the kind of tool you are looking for, it works fine … After you’ve sanded down and strapped up the handle and then spent several hours regrinding the blade! Three things strike me about these kinds of knives. Firstly, I thought Paul’s most telling comment was that he mostly used the knife for chopping shelter materials and fire wood. 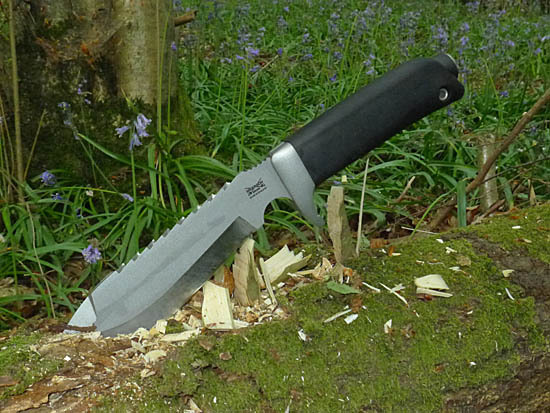 I always prefer to try and define the problem before settling on a solution: so, if the most likely requirement in a survival situation is for a chopping tool, then why not choose the best? Perhaps, a small belt axe might be a better choice. Secondly, a minor point, but I do wonder how well those button compasses will continue to function after all that chopping? More generally, a survival kit in your knife handle sounds clever, but is it really? I think, at best, it would serve as a back-up. Lastly, leaving all fashions and fads aside, who would carry such a large and heavy knife in today’s times? Particularly as a piece of emergency equipment, always on their person? I suggest that few people would, precisely because of the size and weight, whatever such knives practical capabilities. Therefore, in my opinion, these knives are not very realistic products. It would be interesting to conduct a survival scenario with a more “likely” knife, like a Leatherman or a Swiss Army penknife – the kind of tool much more likely to be found on people’s kit lists. And, I’ll bet, the difference in knife would have a profound effect on the skills needed to survive. I agree with you. The Dartmoor, in my opinion,was developed during a period when ‘Bushcrafting ‘was primarily based on Survivalist and Military ‘thinking’. Bushcrafters have evolved and also taken more time at looking around the world for other solutions. Solutions often coming from primative technology rather than modern society. Again in my opinion the simple Axe has many advantages over the Dartmoor- as you highlighted James. Again I return to your point James – a test of a tool such as a leatherman – something more likely to be found about your person in everyday life would be very interesting. I have never tried a “survival knife” and probably never will, you can fit all that kit and more in a small tin in your pocket. I really like the look of the Ray Mears bushcraft knife, but being on a limited budget that is totaly beyond my reach, i tried 2 copies of that design neither faired well, one wasn’t properly hardened and the other was made with a scandi grind but with a second taper near the edge which would have taken hours to re grind and it didnt hold its edge very well anyway. My favourite knives are the Mora which is absolutely fantastic for the price! And for my main knife I eventualy settled on a fallkniven F1, which has coped with everything i have thrown at it, from chopping to some quite heavey duty batoning, and the back of the knife works very well with a fire steel, the only downside i would say it has is the handle isn’t quite as comfortable as it could be, and being plastic it isn’t really sandable to imporove the shape. But even that is only a minor niggle. As James pointed out the chances of actually having a survival knife about your person, when you really need it are slim anyway, especialy these days when a minority of morons have turned knives from “tools” To “deadly weapons”, so carrying one is more likely to get you arrested than save you in a survival situation. The knife I carry with me 99% of the time is a swiss army camper, it doesn’t have all the gadgets of the bigger swiss army knives, but it has 2 blades one full size and a smaller one for finer jobs, a tin opener which has got me out of trouble on more than one occasion, the mandatory bottle opener and corkscrew and a saw, which for its size is excellent. For things like making yourself a walking stick, feather sticks, it takes in its stride, I have just tried it on a 2 1/4 inch thick log and it went through it no problem, not as quick as a bahco, but hey you don’t have one of those in your pocket 24/7. Finally got round to reading this article (and the associated comments) today and it made me smile for a number of reasons. Firstly knives are a funny subject. Inexplicably boys and men seem drawn to them. Jokingly in this house, there is a phrase – “a boy can’t have too many knives” definitely directed at me! Having said that, I probably don’t come close to some people you might see at Wilderness Gathering! But its true I spent a lot of time since I owned my first sheath knife as a Scout trying to find the right knife. And so when I first read RM’s first book I wanted the Wilkinson survival knife. And like so many others, when I finally found it, it was way out of my price range. But the other part that made me smile was your blow by blow account of what you did over the three days. And your conclusion that it is knowledge, not tools, that helped you. Liked that. And I liked the bit about enjoying the woods – that’s what its about, well it is for me anyway. Think this was one of your best ones. Cheers Paul, see you soon. Thanks for your nice comment. As you noted, I had an enjoyable time in the woods and the article was fun to write. Even if I’m having an uncomfortable or tough time in the outdoors, I always remind myself that I’ve chosen to be there and that’s because I enjoy it. I also enjoy helping others get the most out of their time outdoors too. Thanks again and see you next month. Like many of the posters I spent a lot of time in Survival Aids (the one outside Euston station) and managed to go to their closing down sale – lots of bargains. If you are really interested I have an original RM Wilkinson Sword knife – with all the bits, original box etc. I have hardly used it. I also have the Navy Seal Buckmaster with all its kit, box etc. bought in the early 80’s. Again hardly used. And the Buckmaster! Now that’s a piece of 1980s survival heritage too. Oh and their offer to the readers of your blog….. I guess the prices you’ve mentioned is money off – rather than the price of the knife! The offers are the spare parts you get free if you buy the stated category of knife. Great experiment, realistic. I use the knife of the Dutch Commando’s as a general survival knife, although this does not have a hollow handle. 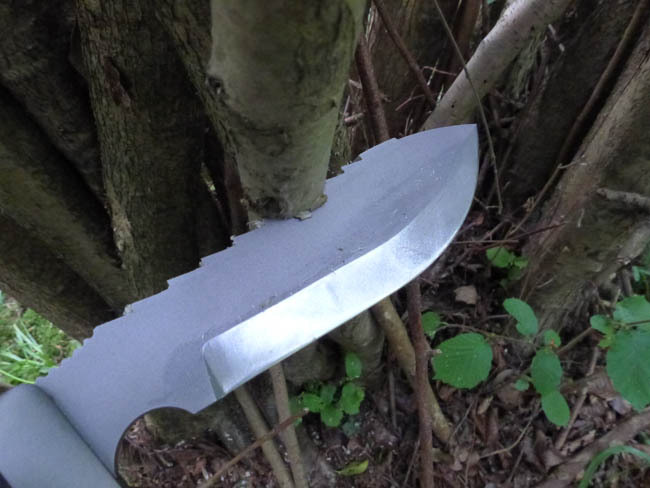 Hillknives is a company that delivers it, including a test report delivered by special forces. Yep, it seemed the logical way to approach this test. There are many knife “reviews” on the internet where people film the knife in their living room and talk about the features of the knife. Sure this is descriptive and not without value but to know the value of the knife, it seems to me that you have to go out and use it for its intended purpose. The more realism, the better I think. When I heard that Wilkinson Sword were getting out of knife production I bought one of these babies as a kind of souvenir, but up to now I haven’t used it. Having just read (somewhat late!) your excellent review I have decided to get it properly sharpened, commision a leather sheath for it and bring it out of hibernation. Having a quality tool like that in its box is like keeping a race horse in the stable. Have you had your knife properly sharpened yet? It would be good to know what you think. Also, let us know what you think of a leather sheath compared to the standard plastic one. Who is making it for you? Finally, drop me a couple of photos once everything is completed. I felt that the plastic one, although functional didn’t quite look the part, so I had a few messages with Lee to work out what I wanted. I’d be interested in your view. Thanks for the update. Lee has done a nice job on the sheath. It looks distinctive and fits the style of the knife. Excellent review – I too find your brief survival experience an interesting read. I must confess I have no wilderness skills albeit a skill-set like that could be so invaluable. I too bought one of these knives back in 2005 – I’m a collector rather than a user of my blades however and so it has remained in its box untouched since the day it arrived. Indeed, possibly rather sadly, I remember I have it perhaps once a year as it is locked away given that I have never intended to use it. I won’t part with it though, it remains a piece of WS history for me and will be cherished as such. Even though knives of this type were designed to be used, it is comforting to know that there are some which remain in mint condition. As you say, they have historical value as well as practical value. That is funny and interesting to hear of your long-term experience with the knife and its durability. I’ll be interested to see details/ a picture of your custom replacement. I also visited the original Morland shop and bought my Mauser knife there. I still have it – and it’s still one of my favourites. It’s good to hear from you. I can relate to the story of you checking out the knives in Survival Aids (later Penrith Survival). It’s something I did as a teenager. You’ve read my views on the knife above. It sounds like the modified version you have acquired gets the most out of the design. The serrations are indeed a waste of space, so it makes sense to remove them. The steel is very hard and difficult to sharpen in the field. Even a file that cuts through my Gransfors axes like butter hardly touches this knife. It really needs to be re-ground to a decent profile to get it sharp. But once it is sharp, it’ll stay sharp for a long time. This is quite a good attribute for a survival knife. The downside is that it’s harder to sharpen in the field once the edge has dulled. I’m really glad that your customised version is everything you wanted. Please do let us know how it performs over time. Ah, the Survival Aids catalogue-I remember it well, as a boy, then young soldier. I think I eventually bought a hollow handled knife with those catapult attachments on the scabbard! Still, it did seem ok at the time, and I am pleased that we can still look fondly at these things rather than falling in line with the attitude that seems to prevail these days, i.e., the kit we used to use was all rubbish. Signed up for your blog today; wife has been griefing me because I’ve hardly moved from the computer! I’m glad it’s kept you occupied (you can tell your wife it’s my fault). Ah yes, fond memories. The number of people I meet who lusted after a WS knife, having perused the Survival Aids catalogue is quite remarkable. I never had the hollow-handle knife with the catapult but my friend did and I remember it being superior to the even cheaper knife I had. His had a metal sheath to which you could attach the blade to create wire cutters. Is this the one you had? We tested it on a few fences. It worked very well!! Yeah, that’s the one! In fact, I have the current survival aids catalogue, which I picked up for my son, who recently joined up, and the knife is still in there! I remember using it to pretty good effect on a course with Eddie McGee, when I was based in Ripon. I have to say that I’m far happier now with a bushcraft knife (Arthur Wright and son, even though it gets poor reviews; I find it pretty good) and a lot more knowledge than I had then!! It’s good to hear from you. Yes, I used to visit the Euston shop occasionally. There was also one in Rose Street in Edinburgh – where I lived for four years while at university there. I scraped together some of my student money to buy a Gore Tex double hooped bivvy, which I then used on various hiking trips in the highlands, including the West Highland Way. I always liked the mix of kit they had in their stores. Ill check out Penrith Survival. As for high boots, I got a pair of Lowa combat GTX and like you, it took a bit of time to get used to the height of them, but now I love them, no need for gaiters with them really, look forward to reading the write up on the Lundhag’s which look even higher than my Lowas! The Lundhags are higher. Very different boot overall and took some getting used to, which was surprising given I have a set of felt lined winter boots of a similar design which have always been great straight out of the box. I hope this is ok to post. I was having a clear out and came across the black version Dartmoor knife which I bought years ago and kept it as a sovenior so has never been used. Would anyone like to buy it? I have no use and no need to keep it as I now know there are people out there who will use it as WS intended. I can email pictures, open to offers. All the survival kit still in unused condition. I was only testing the knife. I have no connection with the sale or distribution of this item. A good read mate,sounded an enjoyable few days and the article and comments meander nicely down memory lane. Remember that catalogue , seen the Dartmoor a few times but never really hankered for one. Do still have an old Mora Scout (still available) and the Kershaw Survival Knife (amongst others) that both still get used for things today. The Kershaw of course being from a similar school of knife. Interesting article as always. In my own world I always think that survival knifes are a bit of a misnomer. As a civilian….if i was to fly to somewhere like the jungle or Pacific island for an adventure and the plane were to crash, my knife would have to be locked away in the hold of the plane and as such would be of no use to me what so ever. I own a large collection of knives, some for their beauty and craftsmanship, some for their shape and materials. During the course the course two years ago I tried your own design of knife, far to heavy for me with arthritic limbs. But each to their own. I guess my point is that to call a knife a ‘survival knife’, one must have it on their person at all times. And with the archaic laws we have, that simply is not possible. Ahh, the 80’s. Baden Powell, Lofty Wiseman, Ray, Rambo and that Survival Aids catalogue have a lot to answer for don’t they 🙂 I always used to salivate on the page where the Goretex bivi bag featured. Breathable waterproof fabric?? What is this witchcraft they speak of? I bought two of the finished CSK185’s (without the laser etchings) just after the WS factory shut down. They both were finished as they would have been coming out of the factory just before closure, and yes, as others have commented, the edge was less than ideal. I tried to sort it but soon realised the mammoth job in hand (really tough steel) and I wanted a symmetrical job done properly. Searching locally here in Northumberland for a craftsman to re profile the edge, I came across Paul Fenech aka “Frenchy”, who sorted it for me, with a finer, secondary “scandi-esque” profile. A sabre grind of sorts. I’m glad I took it to him. He did a fantastic job, and went through a couple of coarse stones on his “edge pro” rig….bloody tough stuff. . I’m pretty sure that it was after our meeting, that Paul secured a number of unfinished blades from Dartmoor knives/sterling supplies, and went on from there with his custom versions. That was nearly nine years ago I believe. The Dartmoor has been with me on a 5 day Trueways course (Glyn nearly dropped his brew when I pulled it out) and every other trip into the woods since. I love it. I also carry a smaller 4″ fixed blade, GF forest axe, (if I’m not hiking too far) and Trailblazer takedown buck saw, but as a “one tool option” I reckon the Dartmoor is canny near perfect. It holds an edge superbly, and can pretty much within reason, do what the axe can, with the added versitality of a knife. Fine carving isn’t it’s forté, at around 5mm -6mm thick, but for general shelter building, hacking through thick or thin brush, and prepping firewood, it is brilliant. In the hand it is really well balanced and is much like a parang, and all the variants of the Lofty Wiseman and Chris Caine tools. It is a heavy beast though, and uncomfortable to carry on your belt. I have affixed an old SA80 rifle sling onto the sheath, and wear it over my shoulder and across my chest, dangling at my side. I have also fashioned a pouch from inner tube to carry a Fallkniven stone, some wax impregnated tinder board, and other bits n bobs. I am close to 50 years old these days, but to be honest I haven’t grown up much since the age of 12. Building dens, making fires, and playing with geet big knives, in the woods is about as good as it gets in my opinion. Loving your YouTube series Mr Kirtley. Thanks. I’m sensing some anger issues here “Doc”. That said, I agree there are better knives out there. I certainly carry something more compact when in the Canadian bush, as you’ll see from studying other pieces on this website. The “fool” who designed the original version of this knife was Ray Mears. He was very young then and later distanced himself from the design, which is understandable. This blog post was written with some fun in mind. I did live off the land for a few days while playing around with this knife. But that should tell you (and anyone else reading) that much of what you need to do to live off the land for a few days has nothing to do with whatever polarised view of cutting tools you might have. Nore indeed has it much to do with the cutting tool you have. I stand by my statement that if I was to have only this knife then I would be happy as it helped with fire and shelter, which were my main two priorities with in P of M-PLAN – Protection from the environment. By the way, if you are being attacked by coyotes or wolves while out in the bush, you really are doing something wrong. As far as I know there is one documented case of wolves attacking humans in Canada. I’ve wild camped in many places in Ontario and Manitoba where wolves are present and never had a problem. Yes, I know you are in Alberta. There is a fear of nature from suburban man on both sides of the Atlantic. Don’t stir that pot. You are doing the wilds no favours.